If you’ve heard of Japanese single malt whisky, then you’ve heard of the Yamazaki distillery. It’s one of the oldest distilleries in Japan, and is owned by the global drinks giant, Suntory. We’re understandably excited for Yamazaki’s 2017 Limited Edition bottling, but first we’d like to introduce you to this very exclusive and highly anticipated collection. Yamazaki whisky has been refined and improved throughout the years, as the exceptional distillery team continue to create some of the most delicate, smooth and deep whiskies in the world. It is, after all, the Japanese way – When something is done, it’s either done well, with an eye toward perfection, or not done at all. Since the distillery opened back in 1923, it has continuously grown commercially across the globe. Today, the Yamazaki 50 year-old is one of the rarest whiskies in the world, and broke records last year as the most expensive whisky bottle ever sold at auction. Dekanta is the only online retailer to have it available! 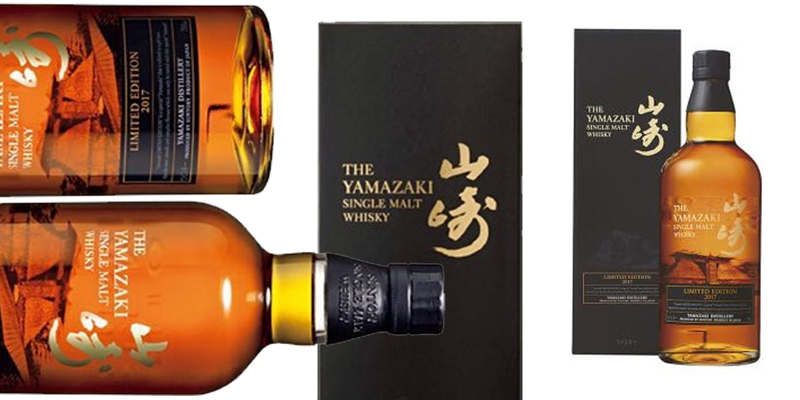 Other releases like the Yamazaki 25 year-old and the Yamazaki 18 year-old have continued to amass awards at global whisky competitions, pushing the craft and beauty of Japanese whisky out to the rest of the world. And, of course, we can’t forget the extraordinary Yamazaki Sherry Cask. The 2013 edition was voted the best whisky in the world in Jim Murray’s Whisky Bible. Yamazaki is the distillery responsible for making Japanese whisky a global phenomenon. They continue to shock and surprise whisky drinkers everywhere, and we’re always excited to see what they will do next. Here’s what’s been happening lately. Since 2014 the Yamazaki distillery has released annual limited edition single malts. The bottlings have grown increasingly popular, even though the distillery always releases the smallest amount of information on the bottles, keeping the whole project shrouded in mystery and exclusivity. Each release is a premium single malt of different vintages, some of which have been aged for more than twenty years. Percentages of the whisky are added to different types of casks, before being brought together to be bottled. So far, the editions released have been placed in American oak casks, bourbon and sherry casks, European oak casks, and sometimes finished in sherry or port casks. Experimentation is at the forefront of the Yamazaki Limited Edition range, and each year the distillery team continue to experiment with the whiskies, making each release more exciting than the last. You’ve probably grown quite thirsty now, after hearing all about these amazing, limited editions, so here they are. The first release was the Yamazaki Limited Edition 2014, then the 2015 edition, and the 2016 edition. If you want to prepare yourself for the upcoming Yamazaki Limited Edition 2017, why not buy the entire Limited Edition set and sample every bottling up until now? Once again, Yamazaki brings fans worldwide a new limited bottling! As before, Suntory has withheld details on the bottling, preferring to give fans a sense of mystery and build up the excitement. The whisky is, once more, a single malt with different vintages of Yamazaki whisky undergoing maturation in different types of casks, before finally being brought together for bottling. While the Yamazaki 2017 limited edition is a single malt, there is no age statement on the bottle, as different percentages of the whisky matured for different periods of time, with some of it maturing for over 20 years. The Yamazaki 2017 is available for pre-order here, and the bottle will be delivered no later than the 30th of June 2017. Just enough time to get really really excited!